Family Offices: The New Deal Masters? PDF: Family Offices: The New Deal Masters? Family offices combine a long-term investment mandate with the flexibility to look for the best investment ideas in any asset class, anywhere. Without the risk of investor redemptions, they can venture out and invest in illiquid and exotic assets. In recent years, family offices have increasingly pursued direct private equity deals. Are they Wall Street’s new deal masters? In the U.S., family offices date back to the days of Andrew Carnegie, and John D. Rockefeller. Growth accelerated in recent decades and today there may be as many as 3,000 offices in the U.S. alone and up to 10,000 worldwide. Growing global wealth, increasing wealth concentration, and disappointment with banks’ wealth management services after the financial crisis have led to this surge in new family offices. According to the UBS Campden Wealth 2018 Family Office Report, two thirds of its survey participants were set up after the year 2000. More than half serve the first generation of wealth. Traditionally, a family office’s primary goal was the preservation of wealth for future generations. Diversification and a conservative investment committee would serve to avoid severe mistakes and permanent loss of capital. However, there are other kinds of family partnerships which are dedicated to building wealth through savvy investments. An iconic example is the Bass family empire which was shaped through its partnership with legendary investors like Richard Rainwater and David Bonderman. A wave of retiring Wall Street icons and billionaire entrepreneurs has also led to the creation of family offices with an entirely different DNA. Other offices have started to build institutional-grade asset management platforms by hiring specialized talent and raising funds with outside partners. George Soros’s family office is currently in the process of spinning out its private equity team into a stand-alone firm. The Pritzker family office recently raised $1.8 billion for its second private equity fund. 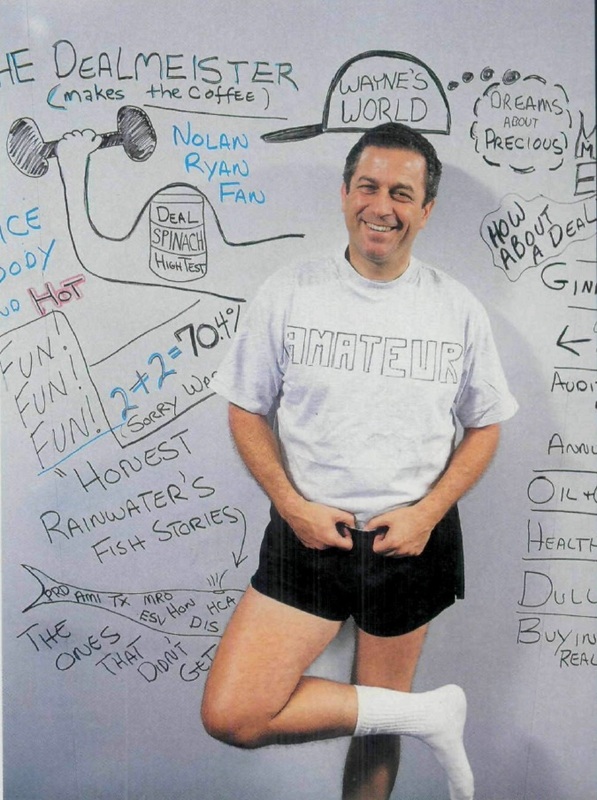 The following is the Pritzker family office’s pitch to business owners: “our differentiated, long-duration capital base provides us with the flexibility to grow our companies and do what’s right for our businesses over the long term.” This message is reminiscent of Warren Buffett’s marketing pitch: to provide a long-term home for business owners unwilling to sell to traditional private equity firms. The promise to retain culture, employees, and management, in exchange for a less competitive sale (that is, a lower price than could be obtained through an auction). But what about the thousands of offices that lack institutional scale and are not led by an investment or entrepreneurial maven? It seems they, too, are in love with the promises of private investing and dealmaking. After decades of strong performance, private equity has evolved into a major allocation in family office portfolios. In search of higher returns, lower fees, and more control, family offices increasingly opt for co-investments and direct investments. 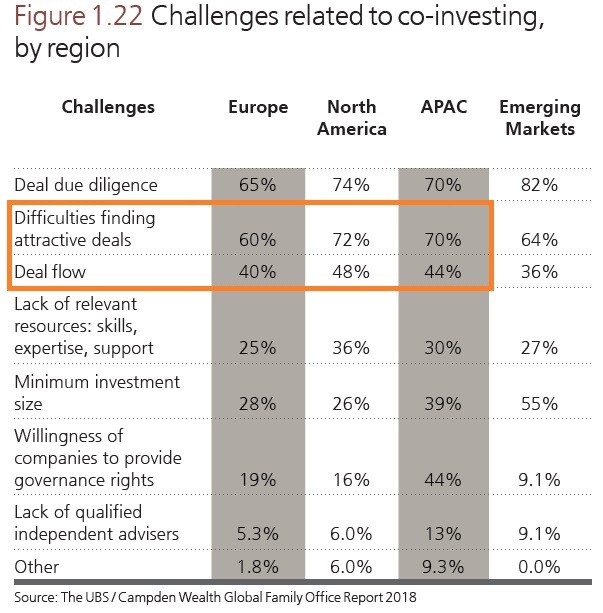 According to the UBS Campden survey, the average North American family office is ten percent invested in private equity funds and fourteen percent in direct private equity investments. Half of all offices in the survey aimed to increase their allocation to private equity direct deals, the highest percentage of any asset class. I believe there are several other important challenges to consider. Does the office have enough dedicated and experienced professionals to source and underwrite private deals? Hiring private equity professionals is expensive, especially if the costs are borne by one principal instead of a large group of limited partners. The average single family office has about 11-12 full-time staff, with three or four on the investment team. 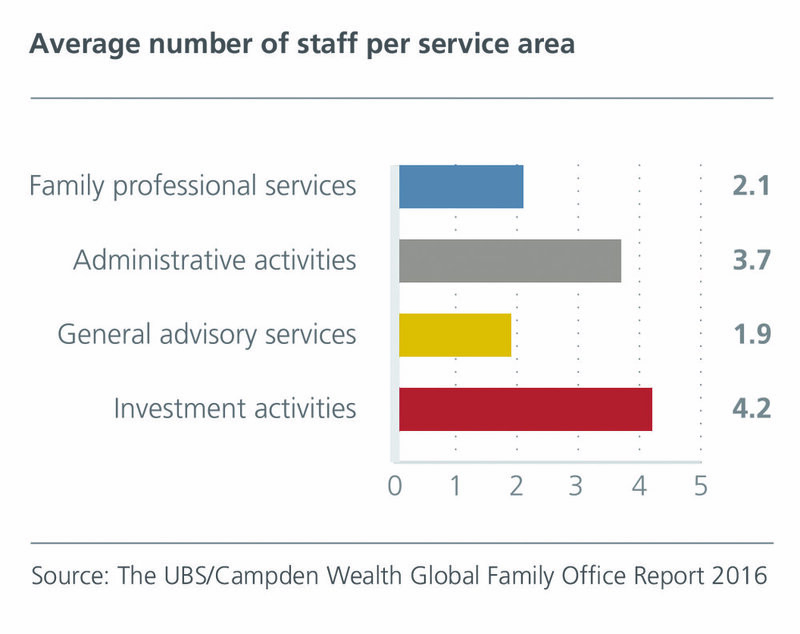 In the UBS Campden survey, only 21% of offices agreed that a staff of more than five was required to invest successfully in direct private equity. It appears that many smaller family offices are confident they can add direct private equity investing to the existing dues of asset allocation and manager selection, without substantially increasing their investment staff. Is the deal team competitive in the marketplace? I believe the best way to answer this question is to compare the team to stand-alone private equity sponsors. Would the family office allocate to its own team, if that team was a third-party sponsor competing with others to raise a fund? That should be the litmus test for any team that does not benefit from truly proprietary sources of deal flow. Since most deal flow is generated through personal networks, one must ask whether the team is truly competitive with established private equity players. Otherwise, the office will likely suffer significant adverse selection in its sourcing effort. Many family offices are notoriously cost-conscious and should carefully evaluate whether they are prepared to pay due diligence and legal expenses for the deals they pursue but don’t close. Private deals also introduce governance and incentive challenges. How are the private equity professionals compensated? If they receive a share of the profits, are they potentially incentivized to invest in even mediocre deals to create a call option-like payoff? Are there prestige or financial benefits from being on the board of directors of portfolio companies, motivating the team to increase the number of investments? Does the family office have an investment committee with individuals experienced in evaluating private equity transactions? And what happens if the family’s risk appetite changes in a market downturn and private deals fall out of favor? The private equity team will presumably either be terminated to save cost or may leave for lack of new investment opportunities. Existing portfolio companies effectively become orphaned and other professionals must take on the role of overseeing and possibly working out the investments. Lastly, is now the right time in the cycle to increase exposure to direct private equity? Private equity dry powder stands at a record $1 trillion. 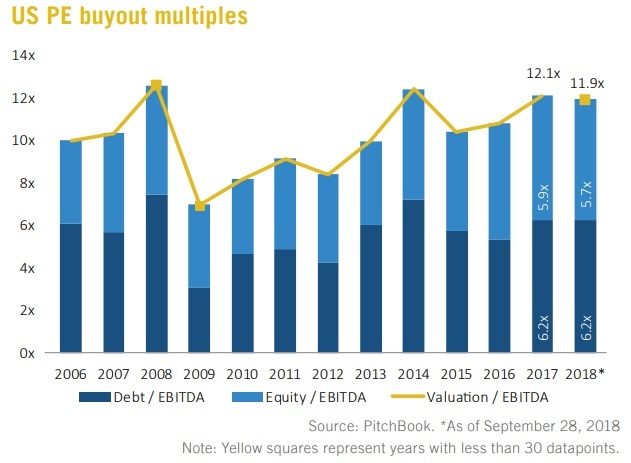 Average buyout multiples in the U.S. are at record highs. And it seems likely that a private equity investment made today will have to be held through a downturn. By adding direct deals to their portfolio today, family offices seem to be chasing returns late in the economic cycle, in an environment of intense competition and high valuations. Undoubtedly, some family offices have an edge through their domain expertise or access to exclusive deal flow. Others have hired or partnered with exceptional investment talent. Combining this edge with long-term flexible capital can lead to excellent investment outcomes. However, this only applies to a small number of firms. Others may find themselves chasing an investment fashion at the end of a cycle and might struggle to sustain their private investment program through a downturn. If you don’t have an edge, it is best to keep things simple and stick to the first order of business: preserve capital for future generations. This is not investment advice. Do your own research and consult with your advisors. Older PostTime to Hit the Panic Button?